As we get into the tough end of the year with the wet season somewhere ahead of us, some producers have plenty of dry grass and some have very little or none. Every year the scene seems to be the same – some properties are always short of grass and others have plenty. Cattle need a feed of grass every day, not too far from water, if they going to be productive. An average sized cow will need around 10kg of dry matter per day in the wet season and 6kg in the dry season. Cattle with little or no grass to eat during the dry season will reward poor management skills with low productivity and even death. The Wambiana grazing trial south of Charters Towers (Queensland) has been running for 12 years comparing heavy (1 animal per 4ha) and light stocking rates (1 animal per 8ha) and its impact on land condition and profitability. The trial has clearly shown that lightly stocked country produces more profit. When the profit per hectare is expanded to an average sized property, the low stocking rate treatment is around $1M in front of the high stocking rate over the trial period. During that time there was seven years of below average rainfall and five years of above average rain. If you have less than 50% ground cover at the first good rainfall event to break the dry season, much of the water will run straight off, taking considerable amounts of topsoil and nutrients with it rather than soaking in where it’s needed. North and North-West Queensland has a highly variable wet season (December to March) in how much rain falls, and its distribution. Historical rainfall records for the majority of North and North-Western Queensland show that we cannot rely on the season breaking until around Christmas time. If overgrazing is a common occurrence on your property you will have seen the good productive grasses disappear and lower productivity from your cattle. There will be more bare ground and increases in poorer quality grasses (like wiregrasses) or weeds, and timber thickening will be commonplace. These are all characteristics of poor land condition. As a land and cattle manager/owner, how is your patch of country looking at the moment? Bare ground and/or poor land condition is a reflection of the management of your resource – like a report card. The Far North Queensland beef team travel extensively across all districts and could easily fill out a ‘report card’ while driving along regional roads at 100km an hour. 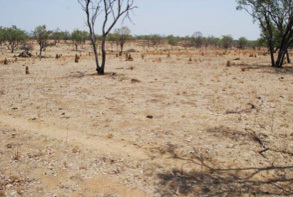 How do property owners travelling around their own place daily not see what is happening and what they are putting their cattle through – extended periods of low grass supply or cattle starvation. We have to match cattle numbers with grass supply. No matter what the excuse, one thing is for sure – starving cattle produce low returns. Fewer cattle mean more grass, better condition cattle, more calves, higher weight gains and lower supplement and husbandry costs. Therefore, more profit. It’s a lot less stressful too. There is an increasing community awareness of environmental issues and the Queensland government has introduced regulations for graziers in the wet tropics, the Burdekin and Mackay/Whitsundays to reduce sediment moving into the Great Barrier Reef. We already know that land condition is closely tied to leasehold renewal. Producers who continue to overgraze their country are giving the beef industry a bad name, and it will no doubt lead to more regulation over the entire industry. It’s time for land managers to take control of the situation. This photo (October 2009) along with district rainfall for the previous 12 months show that, clearly, drought is not responsible for this outcome. Bernie English, Joe Rolfe and Rebecca Gunther, Department of Agriculture and Fisheries, and Kev Shaw, formerly Queensland Government.